Players take on the roles of heroes venturing deep into a three-tier dungeon. Along their way, they explore the dungeon, search its many rooms, and face endless hordes of vicious monsters. Where Dungeon Fighter stands apart is in its unique dexterity-based elements. Players take turns throwing dice at a colorful target board, often from several feet away! What’s more, randomly drawn dungeon effects may dictate that a player must throw his die behind his back, with his eyes closed, under his leg, or under any combination of (often hilarious) restrictions. Keep a steady hand a clear mind, and your team with emerge victorious! 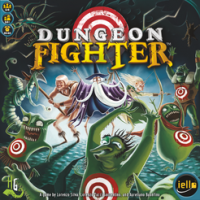 Add a Review for "Dungeon Fighter"